It wasn’t until more than one hundred years after Newton that the idea of energy became incorporated into physics, but today it permeates every branch of the subject. It’s difficult to give a precise definition of energy; there are different forms of energy because there are different kinds of forces. There’s gravitational energy (a meteor crashing into Earth), elastic energy (a stretched rubber band), thermal energy (an oven), radiant energy (sunlight), electrical energy (a lamp plugged into a wall socket), nuclear energy (nuclear power plants), and mass energy (the heart of Einstein’s equation E = mc2). Energy can come into a system or leave it via various interactions that produce changes. One of the best definitions we know reads as follows: Force is the agent of change, energy is often defined as the ability to do work, and work is one way of transferring energy from one system to another. One of the most important laws in physics (the Law of Conservation of Energy, also known as the First Law of Thermodynamics) says that if you account for all its various forms, the total amount of energy in a given process will stay constant; that is, it will be conserved. For example, electrical energy can be converted into light and heat (this is how a light bulb works), but the amount of electrical energy coming in to the light bulb equals the total amount of light and heat given off. If the force is constant, it can come out of the integral, and since F · r = (F cos θ)r, then W = (F cos θ)r.
Notice that work depends on two vectors (F and r), but work itself is not a vector. Work is a scalar quantity. This is a result of the dot product, which multiplies two vectors and produces a scalar. Another result of the dot product is that only the component of the force that is parallel (or anti-parallel) to the displacement does any work. Any force or component of a force that is perpendicular to the direction that an object actually moves cannot do work. Also, since an integral is the area under a curve, if a graph of force as a function of position or displacement is given, the work done by the force is the area bounded by the graph of the force, the x-axis, and the lines representing the starting and finishing positions. Example 1 You slowly lift a book of mass 2 kg at constant velocity a distance of 3 m. How much work did you do on the book? Solution. In this case, the force you exert must balance the weight of the book (other-wise the velocity of the book wouldn’t be constant), so F = mg = (2 kg)(10 m/s2) = 20 N. Since this force is straight upward and the displacement of the book is also straight upward, F and d are parallel, so the work done by your lifting force is W = Fd = (20 N)(3 m) = 60 N·m. The unit for work, the newton-meter (N · m) is renamed a joule, and abbreviated as J. So the work done here is 60 J. Example 2 A 15 kg crate is moved along a horizontal floor by a warehouse worker who’s pulling on it with a rope that makes a 30° angle with the horizontal. The tension in the rope is 200 N and the crate slides a distance of 10 m. How much work is done on the crate by the rope? Solution. The figure below shows that FT and d are not parallel. It’s only the component of the force acting along the direction of motion, FT cos θ, that does work. Example 3 In the previous example, assume that the coefficient of kinetic friction between the crate and the floor is 0.4. (a) How much work is done by the normal force? (b) How much work is done by the friction force? (a) Since the angle between FN and d is 90° (by definition of normal) and cos 90° = 0, the normal force does zero work. The two previous examples show that work, which is a scalar quantity, may be positive, negative, or zero. 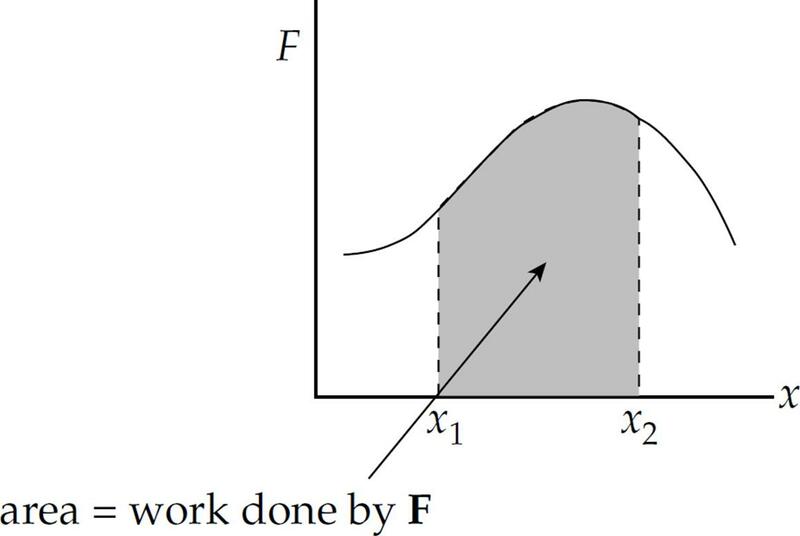 If the angle between F and d (θ) is less than 90°, then the work is positive (because cos θ is positive in this case); if θ = 90°, the work is zero (because cos 90° = 0); and if θ > 90°, then the work is negative (because cos θ is negative). Intuitively, if a force helps the motion, the work done by the force is positive, but if the force opposes the motion, then the work done by the force is negative. Example 4 A box slides down an inclined plane (incline angle = 37°). The mass of the block, m, is 35 kg, the coefficient of kinetic friction between the box and the ramp, μk, is 0.3, and the length of the ramp, d, is 8 m.
(a) How much work is done by gravity? (b) How much work is done by the normal force? (c) How much work is done by friction? (d) What is the total work done? Note that the work done by gravity is positive, as we would expect it to be, since gravity is helping the motion. Also, be careful with the angle θ. The general definition of work reads W = (F cos θ)d, where θ is the angle between F and d. However, the angle between Fw and d isnot 37° here, it was 0° so the work done by gravity is not (mg cos 37°)d. The angle θ used in the calculation above is the incline angle. (b) Since the normal force is perpendicular to the motion, the work done by this force is zero. Note that the work done by friction is negative, as we expect it to be, since friction is opposing the motion. Example 5 The force exerted by a spring when it’s displaced by x from its natural length is given by the equation F(x) = –kx, where k is a positive constant. This equation is known as Hooke’s Law. What is the work done by a spring as it pushes out from x = –x2 to x = –x1(where x2 > x1)? Another solution would involve sketching a graph of F(x) = –kx and calculating the area under the graph from x = –x2 to x = –x1. Note that kinetic energy, like work, is a scalar quantity. Example 6 What is the kinetic energy of a ball (mass = 0.10 kg) moving with a speed of 30 m/s? Example 7 A tennis ball (mass = 0.06 kg) is hit straight upward with an initial speed of 50 m/s. How high would it go if air resistance were negligible? Example 8 Consider the box sliding down the inclined plane in Example 4. If it starts from rest at the top of the ramp, with what speed does it reach the bottom? Example 9 A pool cue striking a stationary billiard ball (mass = 0.25 kg) gives the ball a speed of 2 m/s. If the average force of the cue on the ball was 200 N, over what distance did this force act? Kinetic energy is the energy an object has by virtue of its motion. Potential energy is independent of motion; it arises from the object’s position (or the system’s configuration). For example, a ball at the edge of a tabletop has energy that could be transformed into kinetic energy if it falls off. An arrow in an archer’s pulled-back bow has energy that could be transformed into kinetic energy if the archer releases the arrow. Both of these examples illustrate the concept of potential energy, the energy an object or system has by virtue of its position or configuration. In each case, work was done on the object to put it in the given configuration (the ball was lifted to the tabletop, the bowstring was pulled back), and since work is the means of transferring energy, these things have stored energy that can be retrieved, as kinetic energy. This is potential energy, denoted by U. Because there are different types of forces, there are different types of potential energy. The ball at the edge of the tabletop provides an example of gravitational potential energy, Ugrav, which is the energy stored by virtue of an object’s position in a gravitational field. This energy would be converted to kinetic energy as gravity pulled the ball down to the floor. For now, let’s concentrate on gravitational potential energy. Some textbooks label this Ugrav = PEgrav. Note that potential energy, like work (and kinetic energy), is expressed in joules. The above equation is possible because the work done by gravity as the object is raised does not depend on the path taken by the object. The ball could be lifted straight upward, or in some curvy path; it would make no difference. Gravity is said to be a conservative force because of this property. 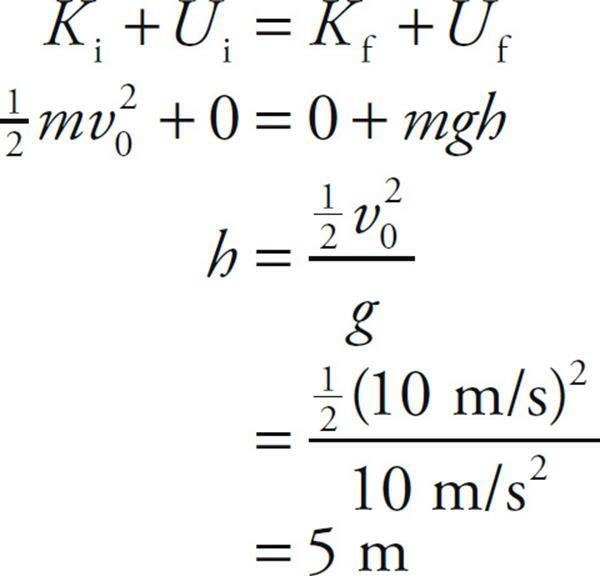 If we decide on a reference level to call h = 0, then we can say that the gravitational potential energy of an object of mass m at a height h is Ugrav = mgh. 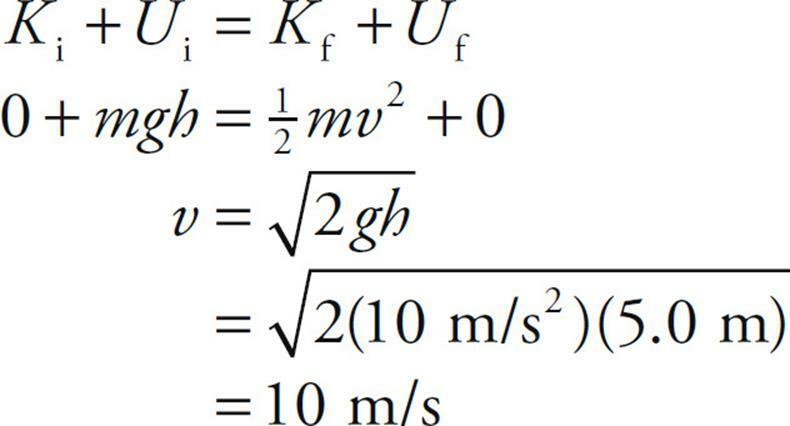 To use this last equation, it’s essential that we choose a reference level for height. Let’s consider a passenger in an airplane reading a book. If the book is 1 m above the floor of the plane then, to the passenger, the gravitational potential energy of the book is mgh, where h = 1 m. However, to someone on the ground looking up, the floor of the plane may be, say, 9000 m above the ground. So, to this person, the gravitational potential energy of the book is mgH, where H = 9001 m. What both would agree on, though, is that the difference in potential energy between the floor of the plane and the position of the book is mg × (1 m), since the airplane passenger would calculate the difference usingmg × (hf – hi), which, for our case would be mg × (1 m – 0 m), while the person on the ground would calculate it as mg × (9001 m – 9000 m). Differences, or changes, in potential energy are unambiguous, but values of potential energy are relative. Example 10 A stuntwoman (mass = 60 kg) scales a 40-meter-tall rock face. What is her gravitational potential energy (relative to the ground)? Example 11 If the stuntwoman in the previous example were to jump off the cliff, what would be her final speed as she landed on a large, air-filled cushion lying on the ground? This is the simplest form of the Law of Conservation of Total Energy, which we mentioned at the beginning of this section. Example 12 A ball of mass 2 kg is dropped from a height of 5.0 m above the floor. Find the speed of the ball as it strikes the floor. Note that the ball’s potential energy decreased, while its kinetic energy increased. This is the basic idea behind conservation of mechanical energy: One form of energy decreases while the other increases. Example 13 A box is projected up a long ramp (incline angle with the horizontal = 37°) with an initial speed of 10 m/s. If the surface of the ramp is very smooth (essentially frictionless), how high up the ramp will the box go? What distance along the ramp will it slide? Example 14 A skydiver jumps from a hovering helicopter that’s 3000 m above the ground. If air resistance can be ignored, how fast will he be falling when his altitude is 2000 m? That’s over 300 mph! The terminal velocity of a human falling is about 100 mph, which shows that air resistance does play a role, even before the parachute is opened. Example 15 A crash test dummy (mass = 40 kg) falls off a 50-meter-high cliff. On the way down, the force of air resistance has an average strength of 100 N. Find the speed with which he crashes into the ground. 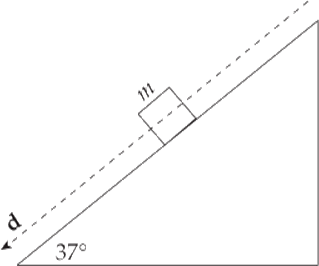 Example 16 A skier starts from rest at the top of a 20° incline and skis in a straight line to the bottom of the slope, a distance d (measured along the slope) of 400 m. If the coefficient of kinetic friction between the skis and the snow is 0.2, calculate the skier’s speed at the bottom of the run. The graph shows how the potential energy, U, varies with position, x. A particular value of the total energy, E = E0, is also shown. Motion of an object whose potential energy is given by U(x) and which has a mechanical energy of E0 is confined to the region –x0 ≤ x ≤ x0, because only in this range is E0 ≥ U(x). At each position x in this range, the kinetic energy, K = E0 – U(x), is positive. However, if x > x0 (or if x < –x0), then U(x) > E0, which is physically impossible because the difference E0 – U(x), which should give K, is negative. Therefore, in this case, we find F(x) = –(d/dx)( kx2) = –kx, which specifies a linear restoring force, a prerequisite for simple harmonic motion. This equation, F(x) = –kx, is called Hooke’s Law and is obeyed by ideal springs (see Example 5). With this result, we can appreciate the oscillatory nature of the system whose energy curve is sketched above. If x is positive (and not greater than x0), then U(x) is increasing, so dU/dx is positive, which tells us that F is negative. So the oscillator feels a force—and an acceleration—in the negative direction, which pulls it back through the origin (x = 0). If x is negative (and not less than –x0), then U(x) is decreasing, so dU/dx is negative, which tells us that F is positive. So the oscillator feels a force—and an acceleration—in the positive direction, which pushes it back through the origin (x = 0). Furthermore, the difference between E0 and U, which is K, decreases as x approaches x0 (or as x approaches –x0), dropping to zero at these points. The fact that K decreases to zero at ±x0 tells us that the oscillator’s speed decreases to zero as it approaches these endpoints, before changing direction and heading back toward the origin—where its kinetic energy and speed are maximized—for another oscillation. 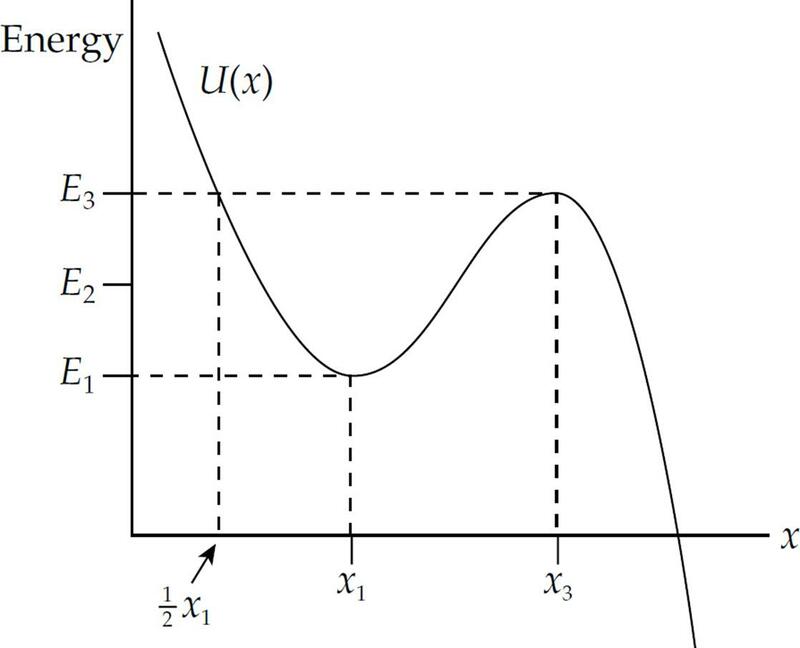 By looking at the energy curve with these observations in mind, you can almost see the oscillator moving back and forth between the barriers at x = ±x0. The origin is a point at which U(x) has a minimum, so the tangent line to the curve at this point is horizontal; the slope is zero. Since F = –dU/dx, the force F is 0 at this point [which we also know from the equation F(x) = –kx]; this means that this is a point of equilibrium. 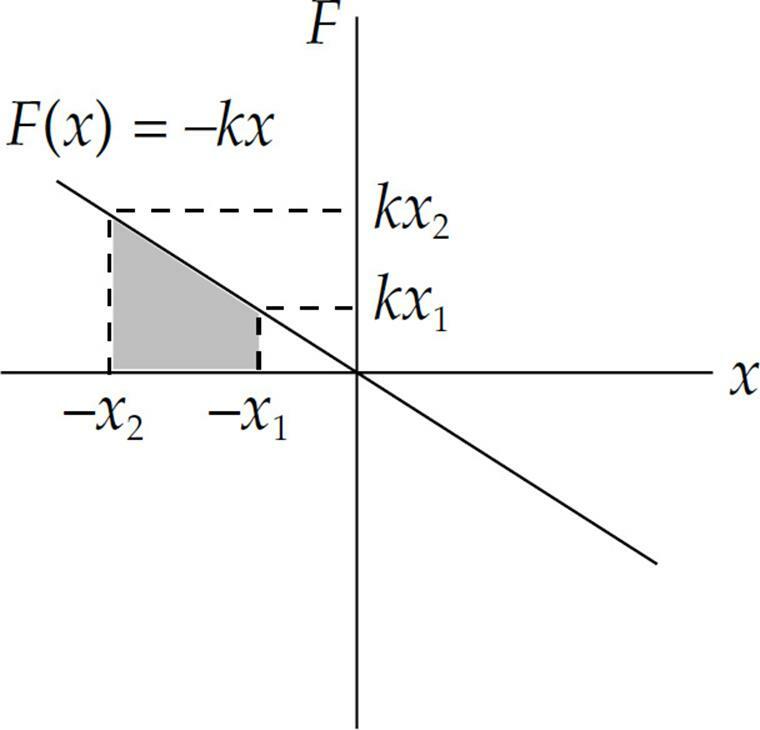 If the oscillator is pushed from this equilibrium point in either direction, the force F(x) will attempt to restore it to x = 0, so this is a point of stable equilibrium. 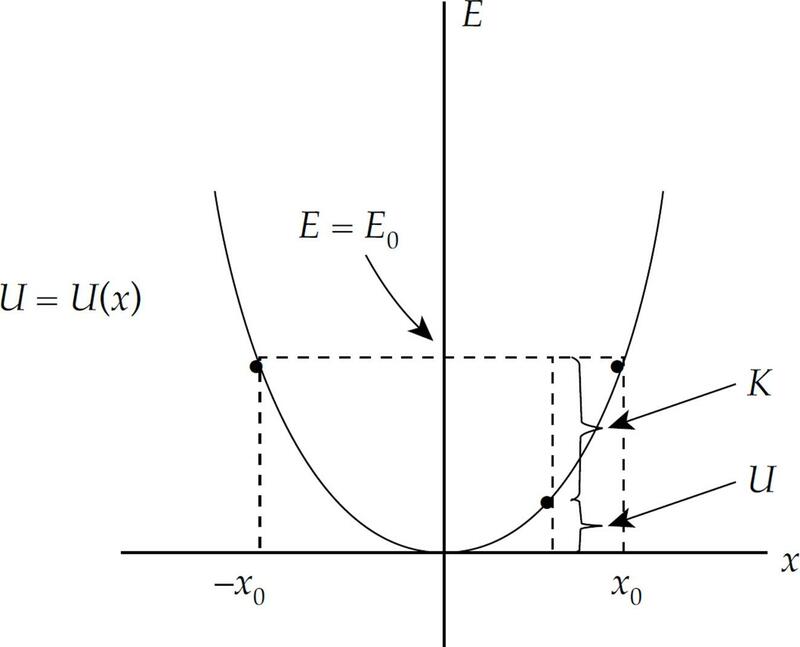 However, a point where the U(x) curve has a maximum is also a point of equilibrium, but it’s an unstable one, because if the system were moved from this point in either direction, the force would accelerate it away from the equilibrium position. Point C is a position of stable equilibrium and E is a point of unstable equilibrium. Since U(x) is decreasing at Points A and F, F(x) is positive, accelerating the system in the positive x-direction. Points B and D mark the barriers of oscillation if the system has a mechanical energy E0 of 0. 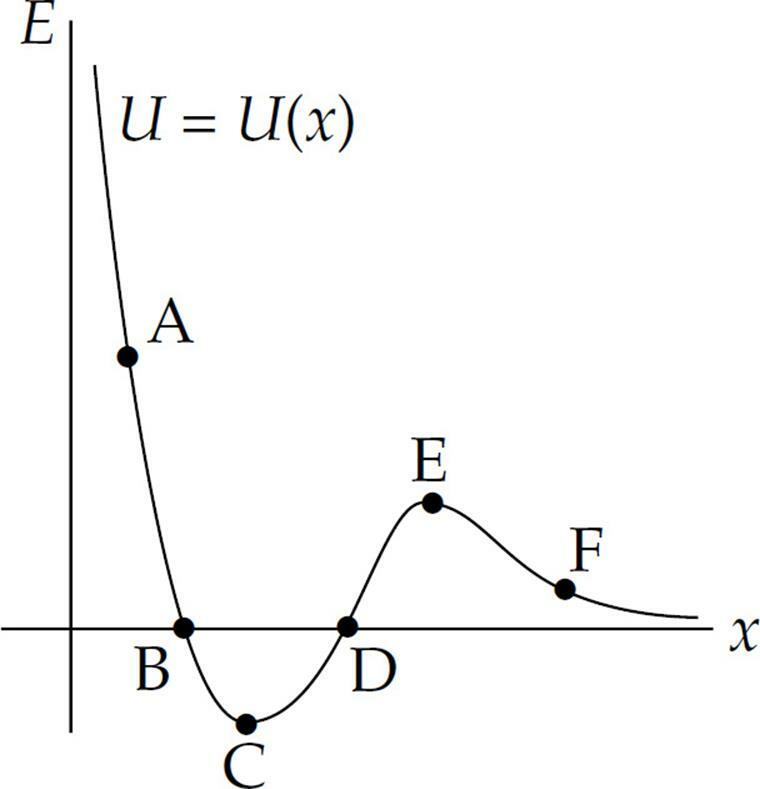 To imagine an object moving in an area with this U(x), imagine an object sliding on a frictionless hill of this shape. If released from rest at Point B, it would accelerate toward Point C, then slow down, stop at Point D, and then return to Point B. It would oscillate between these two points. Where x is measured in meters and U in joules. The following graph is a sketch of the potential energy function. (a) Determine the positions of points A and B, the equilibrium points. (b) If the object is released from rest at the point B, can it reach point A or C? Explain. (c) The particle is released from rest at point C. Determine its speed as it passes point A. (a) The points A and B are a local minimum and maximum, respectively, so the derivative of U(x) will be zero at these locations. (b) The object has a negative total amount of mechanical energy at point B because all of its energy is potential energy. It will not be able to reach point C, because that position has a potential energy well above zero. However the object would be able to reach point A because the potential energy at A is less than the energy the object started with at point B. As the object moved from B to A its potential energy would decrease (become more negative) and its kinetic energy would increase. (c) First we need to find how much potential energy the object has at point C, and this will define the total mechanical energy of the object. Then determine the potential energy at point A, x = 1.3 m, and use conservation of energy to determine the speed at point A. By contrast, a human in good physical condition can do work at a steady rate of about 75 W (about 1/10 that of a horse!) but can attain power levels as much as twice this for short periods of time. Example 18 A mover pushes a large crate (mass m = 75 kg) from the inside of the truck to the back end (a distance of 6 m), exerting a steady push of 300 N. If he moves the crate this distance in 20 s, what is his power output during this time? Solution. The work done on the crate by the mover is W = Fd = (300 N)(6 m) = 1800 J. If this much work is done in 20 s, then the power delivered is P = W/t = (1800 J)/(20 s) = 90 W.
Example 19 What must be the power output of a car engine, which moves a 1000 kg car at a constant speed of 8.0 m/s? 2. Under the influence of a force, an object of mass 4 kg accelerates from 3 m/s to 6 m/s in 8 s. How much work was done on the object during this time? 3. 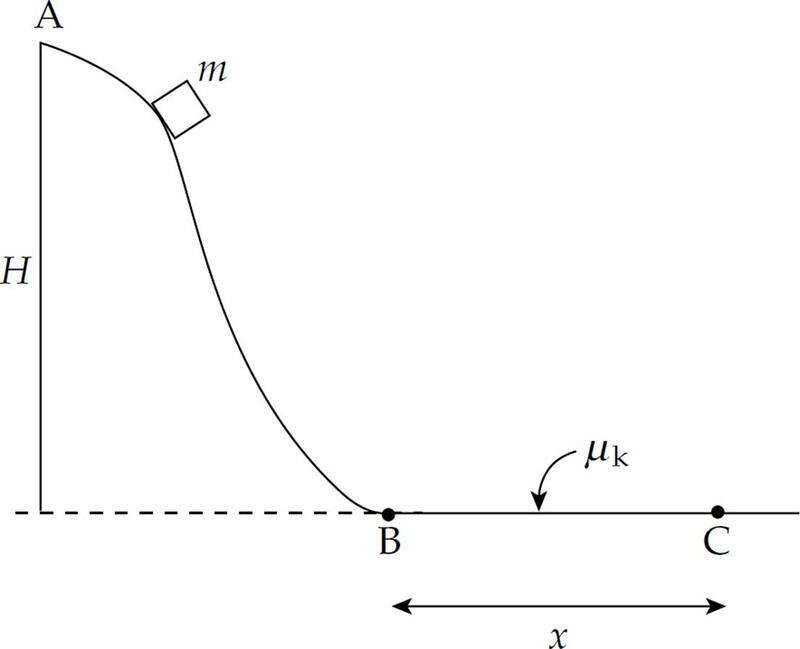 A box of mass m slides down a frictionless inclined plane of length L and vertical height h. What is the change in its gravitational potential energy? 4. An object of mass m is traveling at constant speed v in a circular path of radius r. How much work is done by the centripetal force during one-half of a revolution? 5. While a person lifts a book of mass 2 kg from the floor to a tabletop, 1.5 m above the floor, how much work does the gravitational force do on the book? 6. A block of mass 3.5 kg slides down a frictionless inclined plane of length 6.4 m that makes an angle of 30° with the horizontal. If the block is released from rest at the top of the incline, what is its speed at the bottom? 8. As a rock of mass 4 kg drops from the edge of a 40-meter-high cliff, it experiences air resistance whose average strength during the descent is 20 N. At what speed will the rock hit the ground? 9. An astronaut drops a rock from the top of a crater on the Moon. When the rock is halfway down to the bottom of the crater, its speed is what fraction of its final impact speed? 10. A force of 200 N is required to keep an object sliding at a constant speed of 2 m/s across a rough floor. How much power is being expended to maintain this motion? 1. A box of mass m is released from rest at Point A, the top of a long, frictionless slide. Point A is at height H above the level of Points B and C. Although the slide is frictionless, the horizontal surface from Point B to C is not. The coefficient of kinetic friction between the box and this surface is μk, and the horizontal distance between Point B and C is x. (a) Find the speed of the box when its height above Point B is H.
(b) Find the speed of the box when it reaches Point B. (c) Determine the value of μk so that the box comes to rest at Point C.
(d) Now assume that Points B and C were not on the same horizontal level. In particular, assume that the surface from B to C had a uniform upward slope so that Point C was still at a horizontal distance of x from B but now at a vertical height of y above B. Answer the question posed in part (c). 2. The diagram below shows a roller-coaster ride which contains a circular loop of radius r. A car (mass m) begins at rest from Point A and moves down the frictionless track from A to B where it then enters the vertical loop (also frictionless), traveling once around the circle from B to C to D to E and back to B, after which it travels along the flat portion of the track from B to F (which is not frictionless). 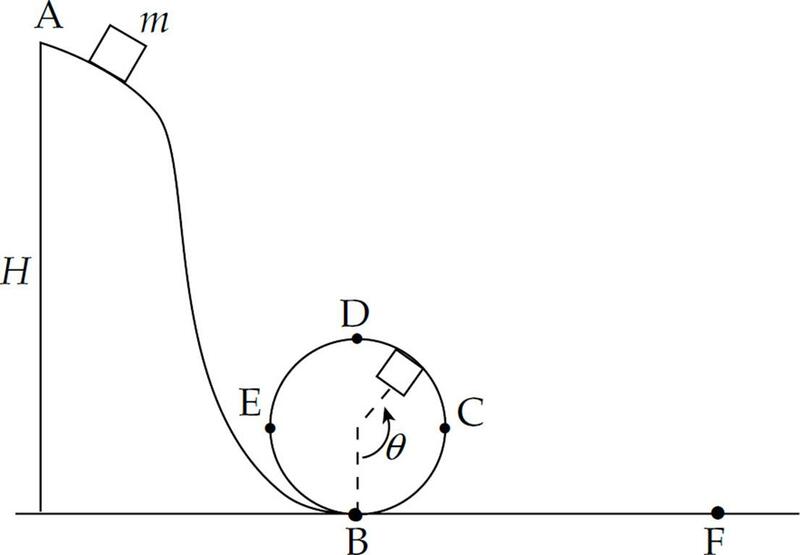 (a) Find the centripetal acceleration of the car when it is at Point C.
(b) What is the minimum cut-off speed vc that the car must have at Point D to make it around the loop? (c) What is the minimum height H necessary to ensure that the car makes it around the loop? (d) If H = 6r and the coefficient of friction between the car and the flat portion of the track from B to F is 0.5, how far along this flat portion of the track will the car travel before coming to rest at Point F? where x is measured in meters and U in joules. The following graph is a sketch of this potential energy function. The energies indicated on the vertical axis are evenly spaced; that is, E3 – E2 = E2 – E1. The energy E1 is equal to U(x1), and the energy E3 is equal to U(x3). (a) Determine the numerical values of x1 and x3. (b) Describe the motion of the particle if its total energy is E2. (c) What is the particle’s speed at x = x1 if its total energy, E, equals 58 J? (d) Sketch the graph of the particle’s acceleration as a function of x. Be sure to indicate x1 and x3 on your graph. (e) The particle is released from rest at x = x1. Find its speed as it passes through x = x1. 4. The force on a 6 kg object is given by the equation: F(x) = 3x + 5, in newtons. The object is moving 2 m/s at the origin. (a) Determine the work done on the object by the force when it is moved 4 m from the origin in the x direction. (b) Determine the speed of the object when it has moved 4 meters. Work is positive when the force and displacement are parallel. Work is negative when the force and displacement are antiparallel. Kinetic energy is energy associated with motion and is given by the equation K = mv2. Potential energy is stored energy. The potential energy due to gravity is given by the equation Ug = mgh. The potential energy due to springs is given by the equation Us = kx2. Work done by a conservative force only depends on the initial and final positions, and not on the path taken. Gravity and springs are examples of conservative forces. Work done by a non-conservative force depends on the path taken and mechanical energy is lost by heat, sound, and so on, when these forces act on a system. Friction and air resistance are examples of non-conservative forces. Conservation of Mechanical Energy states that the total mechanical energy of a system is constant when there are no non-conservative forces acting on the system. It is usually written as Ei = Ef or Ki + Ui = Kf + Uf. The potential energy can be given as U(x). Then F = − . If = 0, then F = 0, and it is an equilibrium point. Stable equilibrium occurs when the force restores the object back toward the equilibrium point after it is disturbed. Unstable equilibrium occurs when the force moves the object further away from the equilibrium point after it is disturbed.